Memorial Day Weekend. It's the unofficial start to Summer. It's also the official start of the boating season at Baltimore Yacht Club, and this year, as we have for the past 5 years, Oracle has been on hand to provide the music to get the summertime party kicked off right! These folks really know how to party. Want proof? With a packed dance floor at 1:00am, we were asked to continue for another hour. At 2:10am, as we finished "Proud To Be An American", the dance floor was STILL packed! 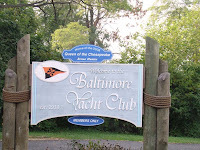 The folks at Baltimore Yacht Club are some of the most hospitable people you will ever meet, and have treated the band as one of their own. When we head to the bar for a soda there are a half dozen folks there offering to buy us a beer. As we are loading in there is always someone offering to assist, or at the very least hold the door for us. Friendly, caring people who know all the band members by name and greet us at other yachting functions at other clubs throughout the year, as well as attending other Oracle Band performances at our public shows. We'll be returning again in the fall to close out the season, as well as performing for the Commodore's Ball in October.